In the 1960s and 1970s, one of the most feared violent revolutionary groups was the Weathermen. It seemed that they had returned . . . and they are better armed. The National Weather Service has reportedly asked for 16,000 rounds of .40 S&W jacketed hollow point (JHP) bullets. 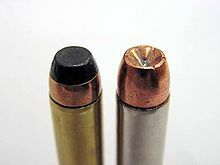 Hollow points — or dum-dum bullets — are illegal under international law in war because they are designed to flattened upon impact and cause massive wounds to targets. Now a spokesman for the National Oceanic and Atmospheric Administration (NOAA) has said it is all a mistake. They are not armed weathermen . . . they are arming the Fisheries office personnel. An additional 6,000 rounds of S&W JHP are to be sent to Wall, New Jersey and another 24,000 rounds to St. Petersburg, Florida. It is not clear why the National Weather Service — part of the National Oceanic and Atmospheric Administration (NOAA) — needs this arsenal. However, it is following the lead of Homeland Security which purchased 450 million rounds of .40-caliber hollow point bullets. Due to a clerical error in the federal business vendor process, a solicitation for ammunition and targets for the NOAA Fisheries Office of Law Enforcement mistakenly identified NOAA’s National Weather Service as the requesting office. The error is being fixed and will soon appear correctly in the electronic federal bidding system. The ammunition is standard issue for many law enforcement agencies and it will be used by 63 NOAA enforcement personnel in their firearms qualifications and training. The question remains why hollow points are standard equipment for domestic federal law enforcement. The Hague Convention of 1899, Declaration III, prohibits the use of bullets which easily expand or flatten in the body. This is a provision governing the weapons used in “warfare.” Notably, England fought to keep dum dums legal in the Hague in 1899, but only one country supported it . . . the United States (which wanted to use them in the Philippines). The vote was 22-2. The question is whether we should be using dum-dums domestically when they are illegal in warfare under international law. While illegal in England and states like New Jersey, they remain common in the United States. Thus, we cannot use them against Al Qaeda insurgents in Iraq but we can used them on a suspect in a fisheries office? aided me out loads. I’m hoping to contribute & help other users like its aided me. Teabag morons will believe anything. But hey, when you have an a news network advocating armed insurrection to morons maybe it’s time the feds stock up. Doesn’t this take away the need for SSA arming. Why should they go to a site where conflict is expected. We don’t call in techies before the shooting has ended. If the proof of fraud is there, it still wil be after the hit. I was hired in the 70’s. We had Special Agents assigned to Office of the Inspector General (OIG). I don’t know about physical tests or if they were maintained. I know I couldn’t become one, because of my eyesight, even though I corrected to 20/20. They usually “investigated” with U. S. Marshalls, Secret Service, or police organizations. The public could keep dead Grandpa’s check and get away with it, but if they had 2 Social Security numbers while robbing a bank, the FBI would consult with SSA. Most people investigated for SSA offenses, had other problems with other agencies, in my personal experience.